Jazz jazz jazzzzz. We're talking about the richest, most innovative, deep and intellectual musical movement of the last century. A beautiful, tragic and frustrating movement long since blown off course by the tide of pop history, its own bum notes, complacency, arrogance and, sometimes, even greed. There is much debate about the origin of the word itself � but most less than prudish scholars now think it derives from a pre-Civil War era bit of Black slang "Jasm", meaning spirited or energetic. This word of course comes from the same funky spunky place we all do in part "jism".New Orleans may now be a hurricane wrecked tourist trap and ghetto parody of itself, but it truly was a special zone. Being part of the poor, confused rump of the French Empire bought by the USA in 1803 and largely isolated from the rest of Deep South, the cultural and racial makeup of NoLA was messy and rich in the way of 18th Century British India, 15th Century Turkey, 14th Century Muslim Spain or 12th Century Norman Sicily. Money, blood, bedrooms, art, kids, speech, faith and music were too fused together for bell clear lines of colour and class to hold straight. These melting moments, all too rare in our retarded post 19th Century obsessions with ethnic identity are when the magic happens.What that magic was will always be a bigger matter of debate than the real location of The House of the Rising Sun as no-one thought it interesting enough at the time to write it down, as it involved people less than white and venues where no-one wore gloves or sat down for long.Few beard strokers would admit it, but for the first half century of its genesis jazz was pop music. Made for entertaining people, getting them to dance, drink, sweat, laugh and screw. The white mainstream was far more interested in aping the middle class melodrama and restraint of Puccini to produce anything as remotely cool as Louis Armstrong.Then something else went down. Coleman Hawkins cut a track called Body and Soul in 1939 where he strayed away from strict harmony and predictable verse/chorus/verse structure into territories far richer and more abstract. Cats like Dizzy Gillespie and Charlie Parker accepted this invitation to move wholesale from Pop to Art with BeBop.And by doing this, they created a far richer musical art but at the increasing expense of alienation from Pop. By the late 50s, Rock, REAL R&B, Doo Wop and friends had shunted jazz off the charts and into late night bars and cafes for the hip and interested. But just as the likes of Mark Rothko ask much more of an audience seeking to understand than a birthday card, an increasingly rich consumer society just wanted to get its groove on rather than explore the outer limits of musical consciousness.So the death started before the War, but the brilliant, beautiful patient stayed lovely and healthy far longer. Then came the late 60s. You had 20th Century Mozarts and Bachs like Miles Davis and John Coltrane playing to bar basements in Atlantic City with crowds smaller than Sky Sports gimpage at a suburban Wetherspoons, while the Beatles made girls faint and more money than could be counted. 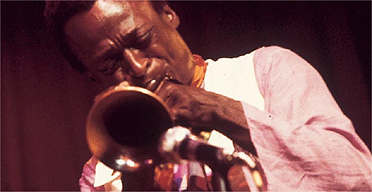 In Europe and Japan, as with all truly great American culture from films to novels, there was a larger audience still, but the signals of the market were clear.Before cutting the Jazz Rock monument that is Jack Johnson, Miles Davis told his producer Teo Macero he would get together "The best rock band you ever heard." Artistically, he was correct. Commercially, he was treading shallower, more polluted water than he realised.For at the Dawn of Fusion you had a real meeting of minds in the classic jazz tradition, with geniuses picking and choosing from all genres and bringing them into an abstract curry hot with ideas. But it was too rock, too funk, soul or Latin for jazz heads, and too jazz for anyone else. So many just kept watering it down into background noise less groovy and interesting than the cheapest, most stupid greeting card ever. This alienated the few remaining jazzers, so well meaning militants like Wynton Marsalis declared 1960 to be a boundary of relevance and much like American commanders in Vietnam who "destroyed the city in order to save it" pickled their jazz into a sometimes interesting, usually banal "music of the museum" that Davis tried so hard to avoid. Of course by the mid 80s he was covering Cyndi Lauper so no one cared.Still, as with any great art, amazing practitioners keep on trying with goals more modest than the most obscure BeBopper. One of them, saxophone alchemist David S. Ware died recently. We are all the poorer.So enrich yourself in our New In this Saturday, starting with the Jazz. We've got Johnny Hodges, Oliver Nelson, Quincy Jones, Miles Davis, Milt Jackson, Modern Jazz Quartet, Archie Shepp...and that's just the start.We've also got African flavours with kanda bongo man, Pepe Kalle, and others. Old skool hip hop baddies the Beastie boys and Public Enemy, KRS One , jungle drum and bass, desired state, sub base recs, dj krust, Goldie, reggae, electronica, blues and rock. Feel it.